This week we celebrate anyone who’s ever spent more than a moment arranging fruit in a bowl. The man planning his planting in the garden. The toddler lining up his tractors DON’T TOUCH THEM MAMA! These people are all artists in their way. Last week we looked at genres and subjects; this week we start thinking about the putting together of parts of a picture. Composition. Whether the image is of people, landscape, still-life or abstract, it must work as a whole in which line, shape, colour and light all interact and play their part. Getting things “right” is a matter of instinct and sorting the subject into something effective and legible often happens before work proper begins. 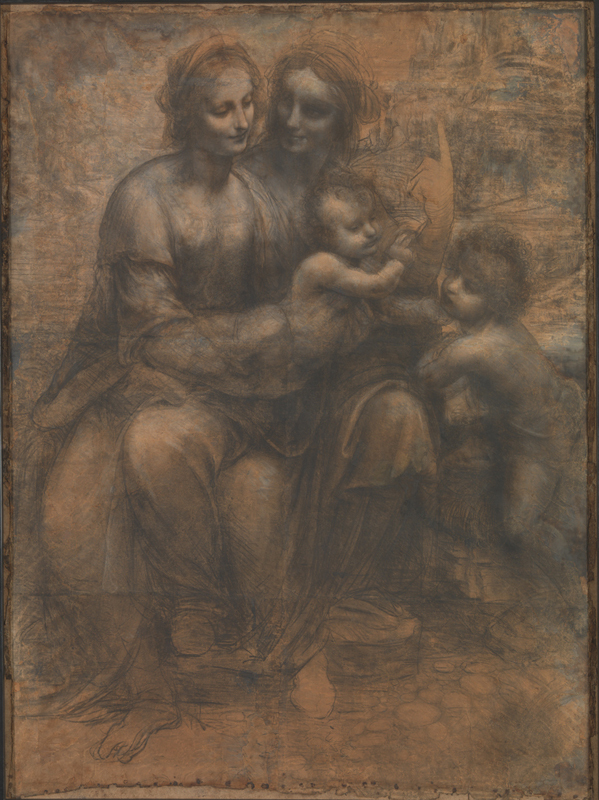 In this drawing Leonardo da Vinci is working out the composition for his cartoon of the Virgin, St Anne, Christ Child and St John the Baptist (a cartoon is a full size preparatory study for a painting). 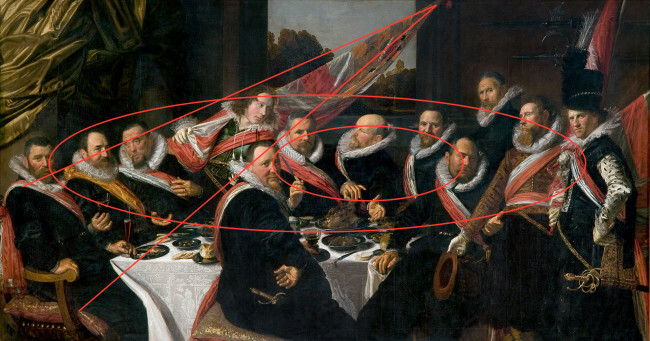 That black tangle of marks is him focussing on the figures, how to interrelate them. Running around the edges of the tangle are a number of alternative frames with slightly differing scales (spot the measurement marks). There is precise method to the madness and THIS is composition in action. I’ve gathered some examples to start us thinking about aspects of composition. Most stories in art taken from history, religion or myth were known to contemporary audiences. 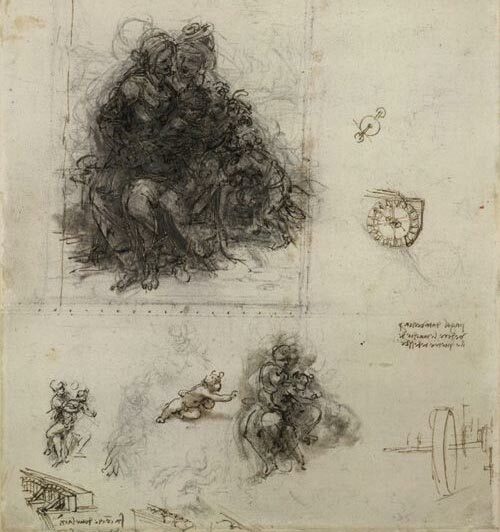 If they’re less familiar now it needn’t be a problem because a good artist like Titian can use composition to help the onlooker understand what’s going on. Here Bacchus god of wine comes out of the forest with fellow revellers. The right side of the painting is dense with detail. The left side is emptier as Titian isolates the moment Bacchus is struck by love at first sight on seeing Ariadne (she’d been deserted by Theseus, seen sailing off in the background). 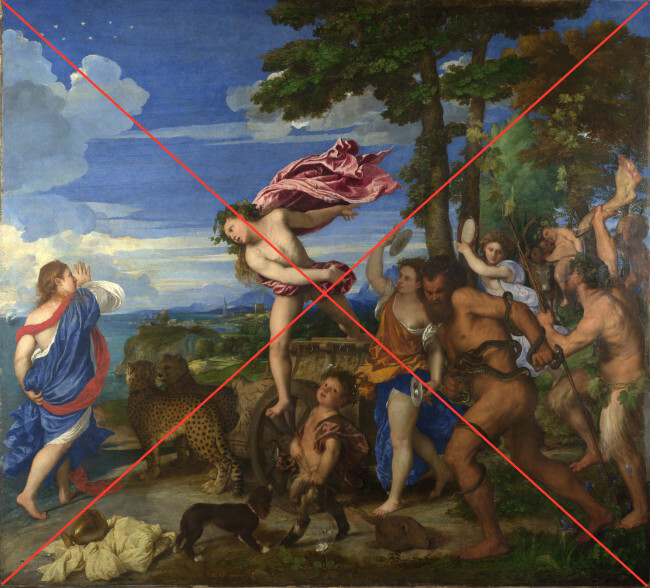 Titian helps us READ the scene by structuring it around an X: he funnels the drunk disorderliness off to the right and flares the feeling of openness and opportunity to the left. Bacchus – reformed, transformed – is caught at the heart of the cross. The stars (Bacchus turns Ariadne into a constellation to make her immortal) are clear and bright up top. Titian is an excellent composer: what could have turned into a senseless jumble becomes a balanced dynamic narrative through his intelligent organisation. With portraiture the artist has to think how best to present his sitter. Format (portrait or landscape), size (which depends on the purpose and practicalities of the image), length (how much to include), view (full face, three-quarter or profile) and scale. 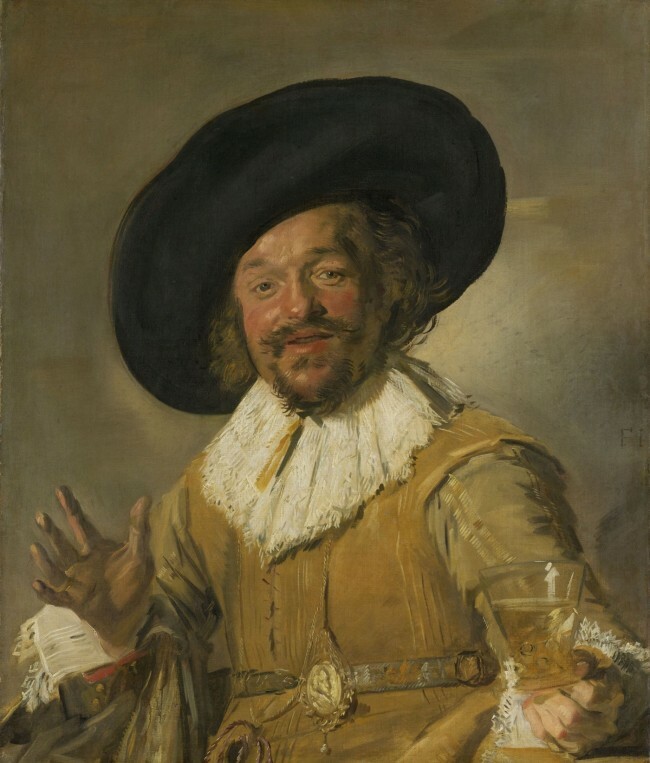 This is how Frans Hals answered those questions in his portrait of a militiaman. If the artist has to paint more than one person this can be challenging, especially if the sitters are not able to pose simultaneously. The group must still gel. Here it’s the space between sitters that plays a key part, as does the background which both encompasses the scene and links the characters. Here the line of the banner pulls your eye into the painting and the oval placement of the people guides your eye around each face in turn. Nice to meet you gentlemen. A wide rectangle (“landscape format”) is well-suited to landscapes. 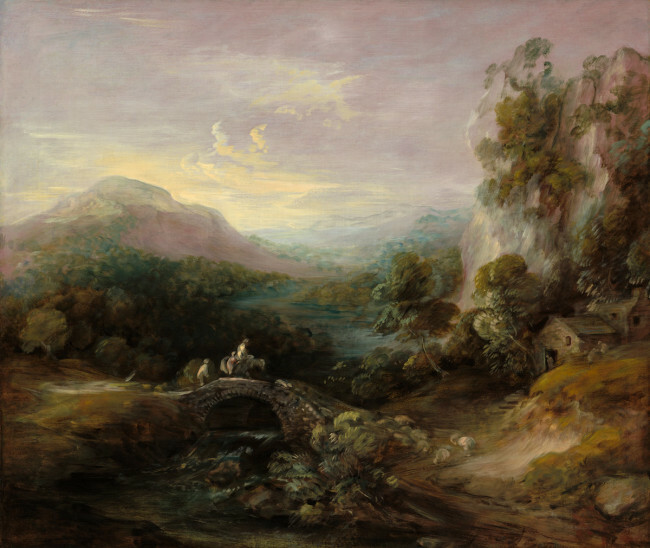 In this image Gainsborough loosely uses a formula for the ideal landscape created by the French artist Claude. He’s amassing forms to the left and right, they act as curtains of a sort, framing the view and adding depth. The people, paths, river and passages of greenery lead the eye through fore and middle grounds and then deliver the gaze right into the distance. These tend to be indoor compositions and – given the amount of control an artist exerts – here’s the perfect chance to create the ultimate composition. In this mixed media construction called Grey Container (1983) Tony Cragg creates a balance and tension between horizontal and vertical axes. 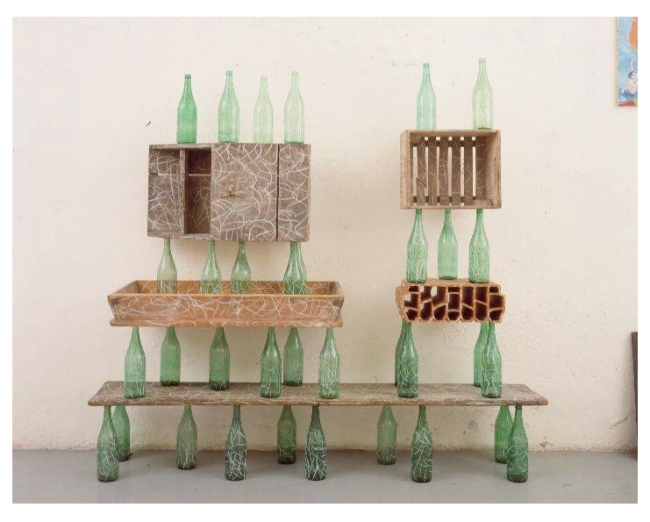 By repeating similar objects he’s encouraging us to se the whole as a sort of design or pattern in which the spaces between the solid shapes are as important as the shapes themselves. Composition is where the eye first alights when you come into contact with a work of art. What makes composition exciting and relevant is the fact that, more than the basic arrangement of forms and decisions about balance and placement, a work’s composition can reveal deep truths about what the artist was aiming to achieve with the work as a whole. Next week we’ll delve into a painting by Piero della Francesca and get to the bottom of his OCD. < Previous What’s it ABOUT?